The holiday of Purim brings happiness and joy at the miraculous saving of the Jewish people. There are Megillah readings, costumes, hamentaschen, Mishloach Manos and festive meals. But for those whose lives have been forever changed due to terror and war, the celebrations can often be very painful as they remember their losses. CTVP understands and ensures that the spirit of Purim is brought to these families so that they can share in the joy even though their pain is not forgotten. They are invited to Megillah readings at Chabad Houses around the country. 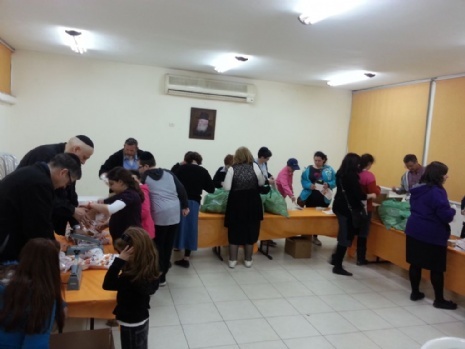 Deliveries of beautiful Mishloach Manos baskets filled with a variety of foods are sent to their homes. Purim is the Jewish holiday that comes with so much hoopla that it’s no wonder why so many individuals and families look forward to it all year long. Between the colorful costumes and brightly packed food gifts, it is a day of pure merriment and joy. Yet for those who have been personally affect by terror attacks in Israel, the day can be bitter reminder of what they have lost. Some are dealing with fresh wounds: 34 people have been killed in terrorist attacks and hundreds have been injured in the last six months as part of a spate of stabbing, shooting and car-ramming attacks in Jerusalem, Tel Aviv and elsewhere. For others, the pain has been a long companion. The Chabad Terror Victims Project notes that more than 3,000 people across the country are in need of comfort over the holiday. “It is extremely important to visit these families, especially during Purim, when the rest of the country is celebrating, and it’s sometimes difficult for them to celebrate,” says Rabbi Yossi Swerdlov, associate director of CTVP, which provides programming, support and services victims of terror and their families. However, the sheer magnitude of the number of people they need to reach in just 24 hours makes it impossible for the CTVP staff to do it alone. 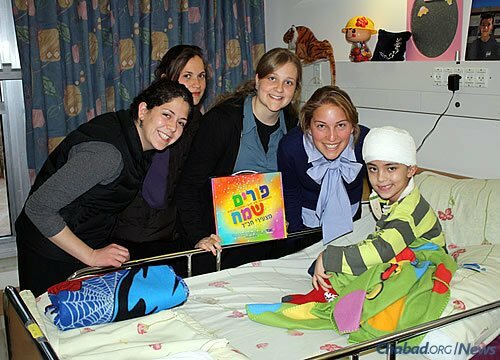 So they turn to volunteers from Israel and abroad who can spend a few hours on Purim day visiting those who need to see a smiling face and reminder that they are not forgotten. One of those volunteers will be Rabbi Yechiel Baitelman, who serves as the co-director of Chabad of Richmond, BC, Canada, with his wife, Chanah. Baitelman and several of members of his local community will be in Israel for Purim and have volunteered to go visit those who were affected by terror attacks there. “The Lubavitcher Rebbe [Rabbi Menachem M. Schneerson, of righteous memory] requested that the joy of Purim and the mitzvot of Purim be brought to every Jew, especially to people who were in circumstances that impinged on their ability to be joyous on Purim,” explains Baitelman. “There was a strong emphasis from the Rebbe on these efforts in Eretz Yisrael, especially for soldiers and officers in the Israel Defense Forces, as well as the widows and orphans of fallen IDF soldiers. The Rebbe instructed that the misloach manot[gifts of food for friends and neighbors, one of the four mitzvahs of Purim]be given to the soldiers as a personal gift from the Rebbe, which he paid for. “I believe that bringing the joy of Purim and misloach manot to terror victims is a clear extension of those directives,” he says. While much of the focus of Purim is on families, they aren’t the only ones who need a little cheer on Purim. 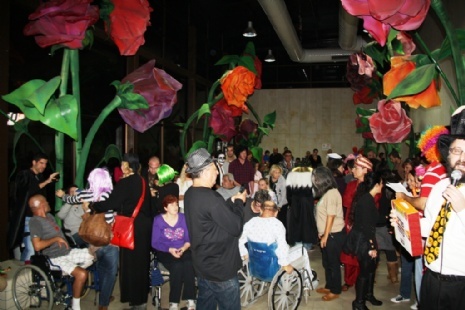 Swerdlov notes that CTVP also hosts Purim programs, including readings of Megillat Esther, for wounded members of the Israel Defense Forces at the Rehabilitation Center at Sheba Medical Center in Ramat Gan. 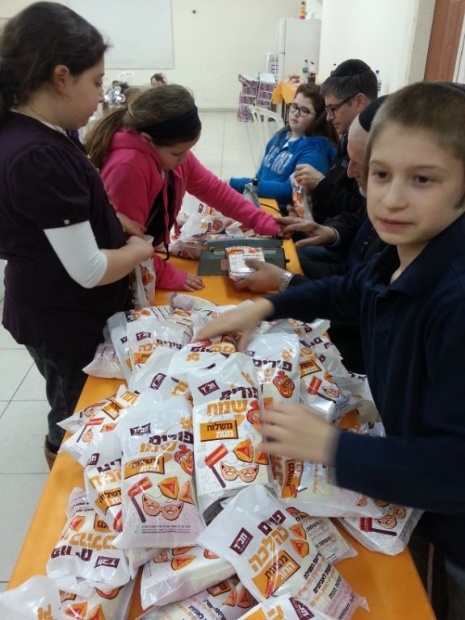 Every person and family that CTVP representatives and volunteers visit on Purim will receive a special mishloach manot package filled with traditional goodies, snacks and more, which is only a small part of what they need on Purim. 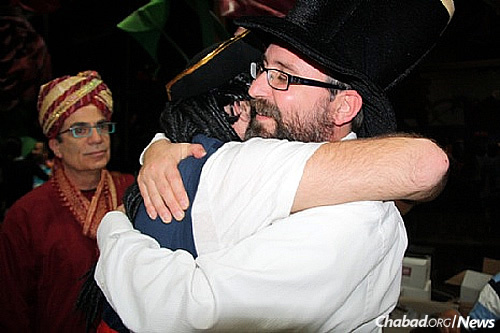 Purim is a festival of merrymaking. We celebrate our deliverance from the evil Haman who tried to annihilate the Jewish people. This year, Purim has deeper meaning for the people of Israel as they struggle with the violence and terror plaguing our precious homeland. Again our enemies seek to destroy us. But we, the Jewish people are strong. Thru history, with the help of Hashem, we’ve overcome our enemies – and we’ll do so now. 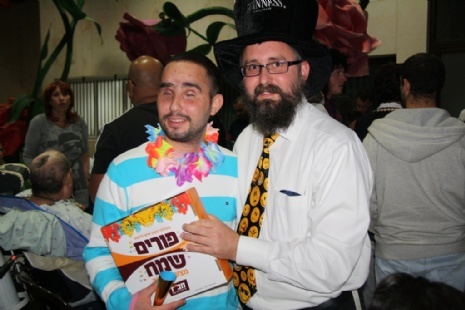 You can show your love and support to over 3,000 families in Israel cared for by Chabad’s Terror Victims Project (CTVP) by partnering with us to bring them the joy of Purim personally. CTVP will visit every family, bringing Mishloach Manos, Megillah readings, Purim meals and the solidarity of Jews around the world to families suffering the trauma of terror and war. If you’ll be in Israel at Purim, (starts March 23/13 Adar II), let us know. We’ll bring you with us on visits. If you’re not in Israel, you can still be there in heart and spirit for our people. 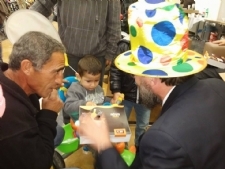 Please join the CTVP Purim Mission 2016. And please be as generous as possible. 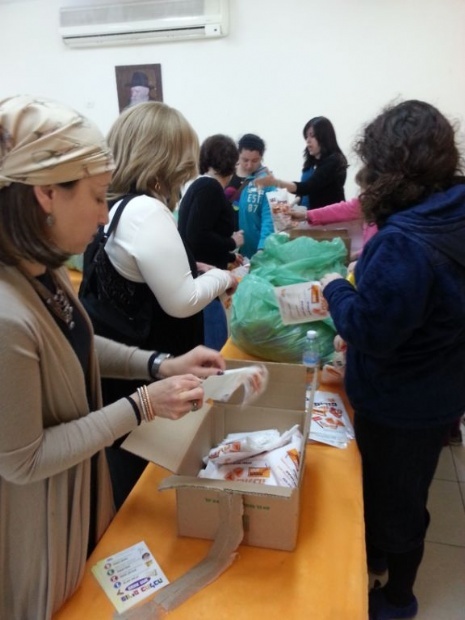 Each Mishloach Manos package costs $7 and we must deliver over 3,000 of them. 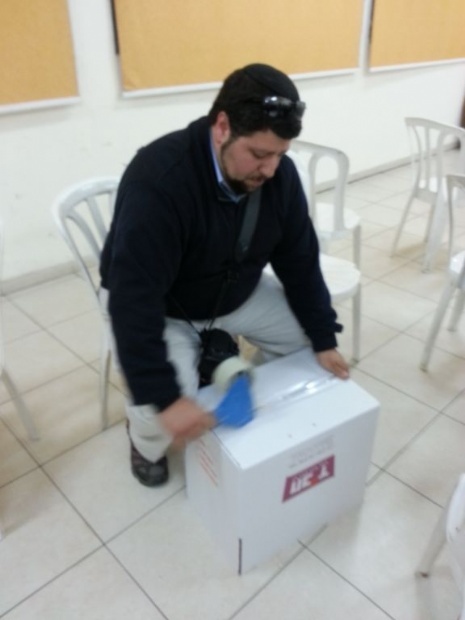 So many families in Israel are suffering from terrible acts of violence. Help us help them. Thank you! And all our best wishes to you and yours for a wonderful, festive Purim!!!! 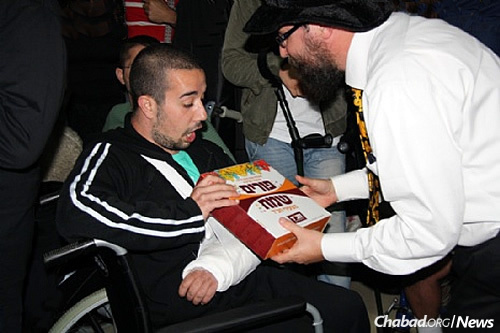 Beautiful packages of Mishloach Manot were distributed to the wounded soldiers via CTVP in honor of Purim. CTVP is in constant contact with hundreds of wounded soldiers with multiple programs throughout the year. From the moment of injury CTVP is at their beside in the hospital, during the rehabilitation and for as long as needed CTVP is there with them. 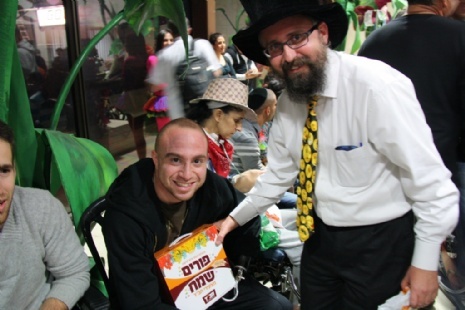 At a special celebration held for them at the Tel Hashomer Rehabilitation Hospital, Rabbi Menachem Kutner, CTVP director of activities shared an inspirational Dvar Torah and distributed the Mishloach Manot. The participants were very grateful and thanked CTVP for their ongoing support. Chabad Terror Victims Project (www.ctvp.org) welcomed Rabbi Zalman and Channie Wolowic along with members of their community who were on a Chabad of the Five Towns Israel Mission to Israel and who came to volunteer their time to help CTVP pack thousands of Mishloach Manot gifts for victims of terror and IDF soldiers and their families throughout Israel. 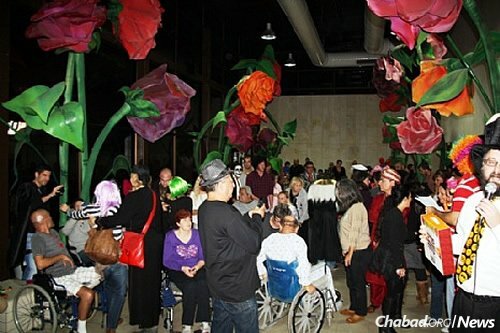 Chabad Shluchim in Israel are preparing teams of thousands of volunteers from all over the country who will arrive on Purim day to visit the families with special wishes for a Happy Purim, and to help bring the joy of Purim into their homes. 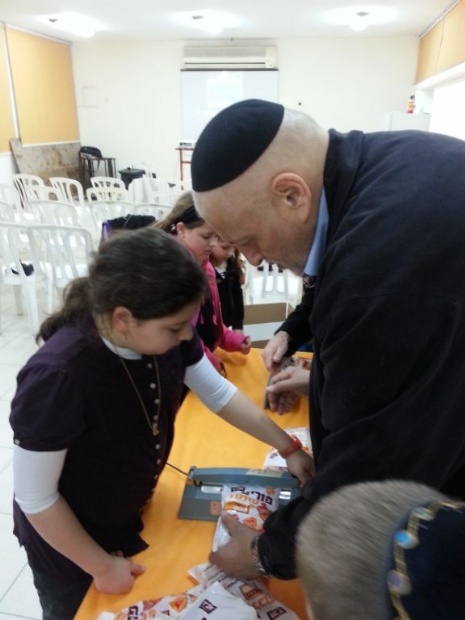 In addition, they will be visiting thousands of army basis, giving out Mishloach Manot, reading the Megilah and bringing with them the joy of Purim. This is a massive undertaking as you have thousands of families and hundreds of thousands solders scattered all over the country There are major logistics that go into this, and it takes many months of planning. 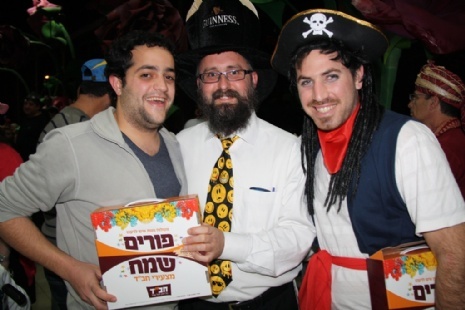 During Purim itself, hundreds of volunteers will leave the comfort of their home and families in order to bring the Simcha of Purim and Mishloach Manot all across the country. The Saroussi family of Tel Aviv knows that for every holiday they will receive a very special visit from Chabad Terror Victims Project (CTVP). They look forward to these visits and the great comfort they bring to them. It is comfort they urgently need. Nine years ago, on a beautiful, balmy evening, Linoy Saroussi, just 14 years old, was murdered in cold blood by a terrorist who infiltrated the community of Hermesh where she and her family lived. The pain and anguish the family has gone through since the loss of their beloved daughter has affected every aspect of their lives. So they look forward to visits from CTVP because they know that the volunteers who come understand what they have gone through. They know they will bring help and hope. But this year, the Saroussi’s were astonished when they opened their door on Purim morning. There stood Member of the Knesset Yossi Peled who had joined the CTVP team to bring encouragement and Purim happiness to bereaved families. 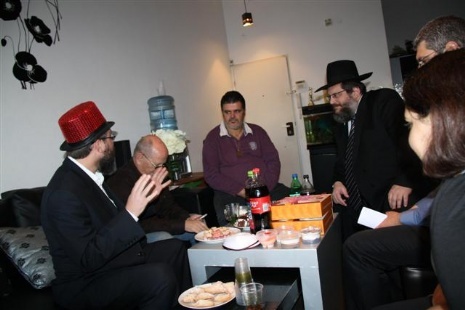 The Saroussi parents, Kobi and Anat, were delighted and honored to greet Minister Peled as well as Chairman of Chabad in Israel, Rabbi Joseph Aronov, and Director of Chabad Terror Victims Project, Rabbi Menachem Kutner. Sitting down to talk together, the Saroussi’s explained to Minister Peled how terror affects a family for their entire lives. The public is interested in the family for some time after the attack, but, as with all things in life, they move on while the suffering family continues to feel their pain and agony. Certain times of the year, they said, are the hardest, especially the holidays like Purim. That is when they feel their loss most acutely. CTVP is there for them at these difficult times – and always. CTVP visits more than 3,000 families of terror victims for every holiday. 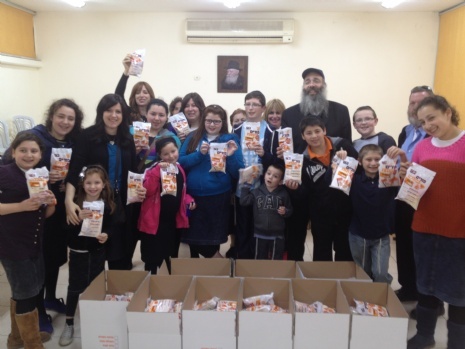 At Purim time they bring an elegant package of Mishloach Manos filled with delectable treats that are lovingly packaged by children and volunteers from Kfar Chabad. They bring the singing and joy of the holiday into the homes of families whose lives have been changed forever. Minister Peled listened intently to all the Saroussi family told him. He was very moved when they told him that since Linoy was killed, they have had three more children. “This is our answer to terror,” they said. They told him how much CTVP helps them and then described how their son was one of the almost 90 children who just celebrated their Bar and Bat Mitzvahs at the Western Wall because of CTVP. Minister Peled offered them his personal Mazel Tov as well as warm expressions of encouragement and strength. He told them how much he personally appreciates all that CTVP does for them and for all the families they help. The financial difficulties that families who have suffered the trauma of terror experience was also a topic of conversation. Kobi then shocked his visitors by telling them that they were being threatened with having their electricity cut off in two days because they couldn’t pay. When Rabbi Aronov heard this, he immediately announced that CTVP will make the necessary payments and that their electricity will not be turned off. 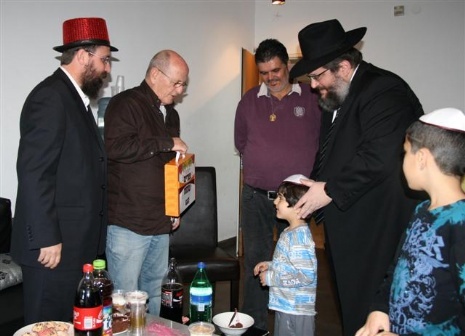 The Saroussi parents cried with relief, calling this their Purim miracle! 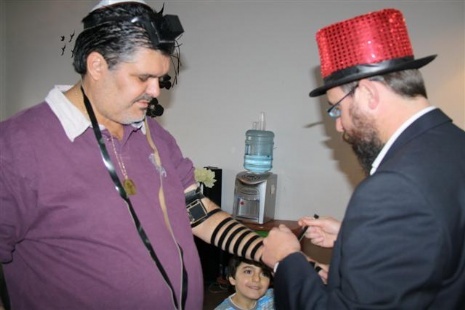 Earlier in the visit, Kobi had put on tefillin. He told Rabbi Kutner then that he felt that this mitzvah would help him with his problems. 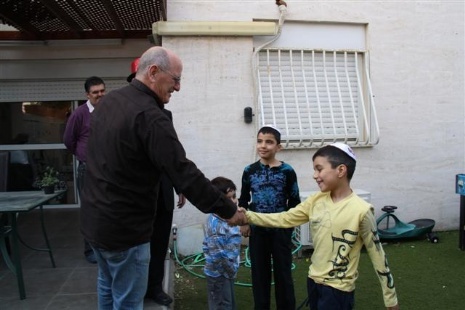 Little did he know how quickly the mitzvah would work -- and that his family would be saved from having their electricity cut off! 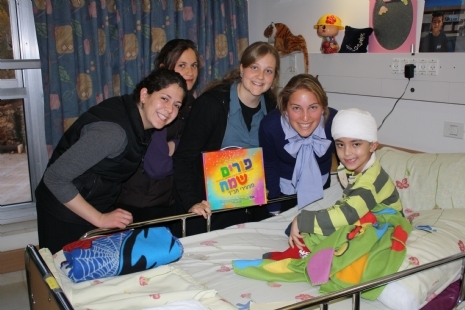 Sending beautiful Mishloach Manos packages on Purim to thousands of victims of terror, Israel Defense Forces soldiers, patients in hospitals, and the elderly and needy is just one facet of Chabad Terror Victims Project’s broad-based humanitarian work that brings comfort and hope to so many in Israel. 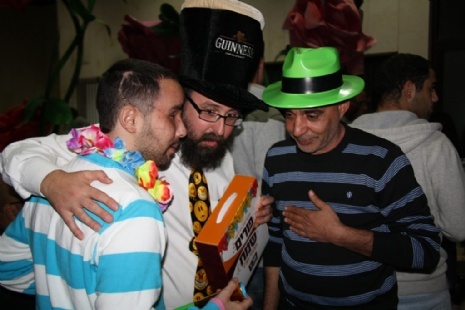 As we do each year, this year too, CTVP organized a very special Purim party for the Israel Defense Forces (IDF) soldiers who were wounded in battle. Following the reading of the Megillah, tremendous joy could be felt everywhere as the soldiers and CTVP staff and volunteers broke into spontaneous dancing and songs from Purim. CTVP is with these wounded soldiers, who are true heroes of Israel, from the time they are injured and throughout their long years of rehabilitation. We are there for them and for their families for as long as they need us, whether it is a month, a year, or many years. One of the most emotional times of the year for them is always during the holidays. It is then that they feel keenly the limitations and restrictions and pain that their injuries have forced upon their lives. It is a time when they urgently need family and friends. At the Purim party, one of the wounded soldiers asked to have the microphone. With deep emotion he explained, “When I was wounded, Rabbi Menachem Kutner of CTVP came to visit me. Seeing the severe injury I sustained and understanding how long my recovery would be, he came back to me a few days later with the gift of a laptop computer, the very thing that helped me go through the initial healing process of being bedridden long-term. “I thought it was to be a one-time gesture. But I was very wrong. Today, six years after my injury, I am so happy about the relationship with CTVP which has been with me all these years as I’ve struggled through painful rehabilitation. They are always there helping to sustain my spirit and my courage.